IslayBlog.com -> 2009 -> The Russian Islay Job? You probably can't make it out in the picture above, so on the left the important detail of the paintwork. 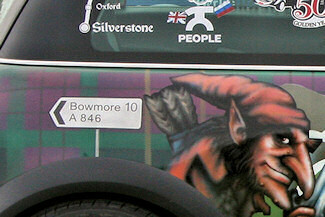 That's obviously a sign to Bowmore above the rear wheel arch, a subtle but nice reference to Islay. The only sad thing is that it is pointing behind them, as if they are driving away. 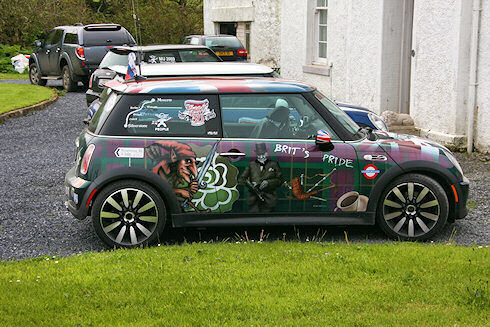 However, as they seem to make these kind of drives regularly I hope they will tell their club members of their visit to Islay and others will follow. 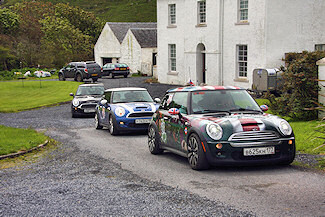 I believe all three cars belong to the ‘Mini People’ Mini Club Russia, the one on the right has many references to it. While I can't speak let alone read any Russian I managed to get at least an idea using the Google Translate service. 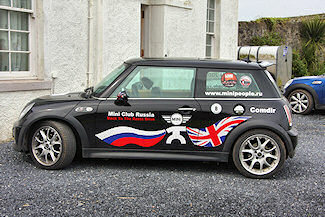 The club was founded in June 2004 as the first Russian Mini owners club and now has members not only from Russia but also Ukraine, Belarus and the Baltic countries. Through their Travel Club their members regularly visit other countries, including ‘Back to the roots’ drives to the UK. Their latest one has now taken them to Islay, and there as far as Kilchoman.